I like your blog! Sorry to hear about your gnome. Would you consider adding links to my blogs? I have two that are 'mom resources'. One's just a fun whatever I want to talk about blog and the other is a recipe blog. I try to stick to recipes that take 30 minutes or less. Thanks for your time. If you think our blogs are compatible I'll definitely be adding a link to you as well. Oh no! No no! No gnome thieving! That's just.. the lowest of the low! 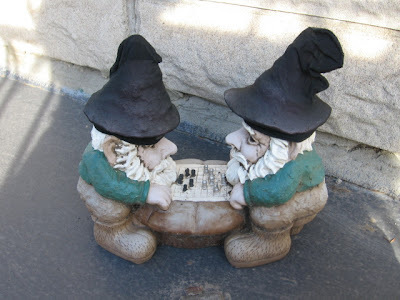 Gnome thiefs? What is the world coming too? I hope he is returned soon! I am crushed, I tell you. Crushed. Give me $6.73 and I'll return him, unharmed. If you don't comply, he gets the shaft. Or shank. I'm not good with prison terms. He could very well show up in a college dorm this fall... (I had some friends in high school that used to rip of pink flamingos and gnomes. When they got to college? The choice decor was flamingos and gnomes. heehee. I loved that gnome like a brother. maybe post some fliers? "Have you seen this gnome?" 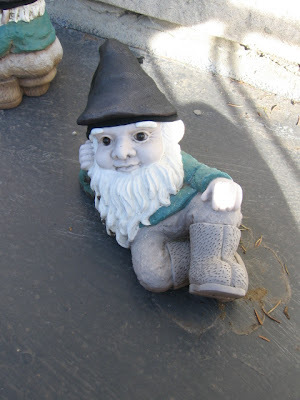 Maybe he wsan't gnome napped as much as he went exploring? 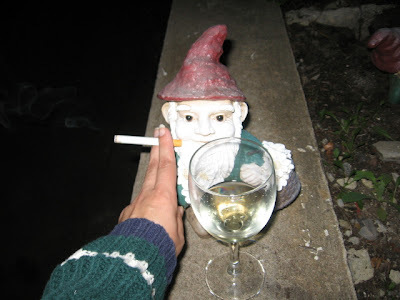 Are there any trashy girl gnomes around?